5632(S, F): A request was made to authenticate to a wireless network. 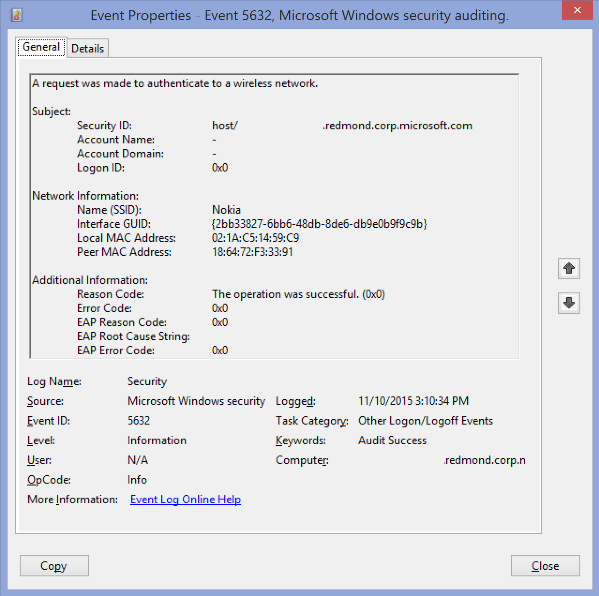 This event generates when 802.1x authentication attempt was made for wireless network. It typically generates when network adapter connects to new wireless network. Note For recommendations, see Security Monitoring Recommendations for this event. Minimum OS Version: Windows Server 2008, Windows Vista. Security ID [Type = UnicodeString]: User Principal Name (UPN) or another type of account identifier for which 802.1x authentication request was made. Note User principal name (UPN) format is used to specify an Internet-style name, such as UserName@Example.Microsoft.com. Account Name [Type = UnicodeString]: the name of the account for which 802.1x authentication request was made. For local user accounts, this field will contain the name of the computer or device that this account belongs to, for example: “Win81”. Name (SSID) [Type = UnicodeString]: SSID of the wireless network to which authentication request was sent. Note A service set identifier (SSID) is a sequence of characters that uniquely names a wireless local area network (WLAN). An SSID is sometimes referred to as a "network name." This name allows stations to connect to the desired network when multiple independent networks operate in the same physical area. Interface GUID [Type = GUID]: GUID of the network interface which was used for authentication request. Note GUID is an acronym for 'Globally Unique Identifier'. It is a 128-bit integer number used to identify resources, activities or instances. “netsh lan show interfaces” – for wired interfaces. “netsh wlan show interfaces” – for wireless interfaces. Local MAC Address [Type = UnicodeString]: local interface’s MAC-address. Peer MAC Address [Type = UnicodeString]: peer’s (typically – access point) MAC-address. Reason Code [Type = UnicodeString]: contains Reason Text (explanation of Reason Code) and Reason Code for wireless authentication results. See more information about reason codes for wireless authentication here: https://msdn.microsoft.com/library/windows/desktop/dd877212(v=vs.85).aspx, https://technet.microsoft.com/library/cc727747(v=ws.10).aspx. Error Code [Type = HexInt32]: there is no information about this field in this document. EAP Reason Code [Type = HexInt32]: there is no information about this field in this document. See additional information here: https://technet.microsoft.com/library/dd197570(v=ws.10).aspx. EAP Root Cause String [Type = UnicodeString]: there is no information about this field in this document. EAP Error Code [Type = HexInt32]: there is no information about this field in this document. For 5632(S, F): A request was made to authenticate to a wireless network. There is no recommendation for this event in this document.